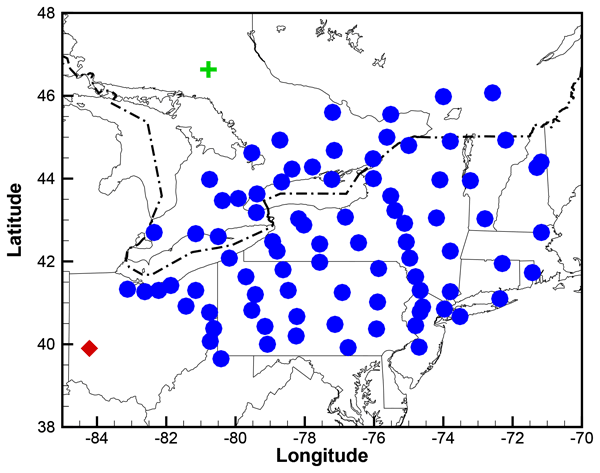 When this study started, its goal was to provide a reanalysis of the stratospheric composition of methane and nitrous oxide, two important sources of hydrogen and nitrogen species in the stratosphere that influence the ozone abundance. However, the goal changed when several issues in the assimilated observations were discovered. Finally, this study illustrates how data assimilation methods can be used to add value to the observations as well as to diagnose their limitations. 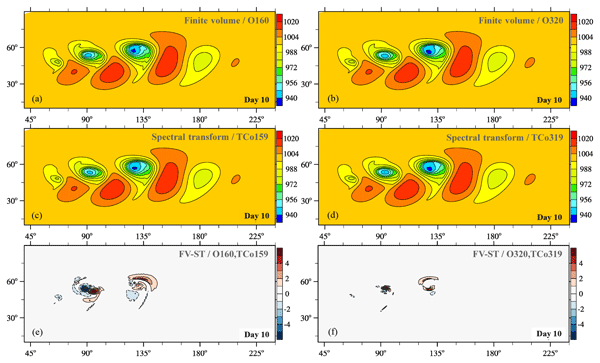 This paper presents the global fingerprint of recent changes in the mid-upper stratospheric O3 in comparison with the lower stratospheric O3 derived from the first 10 years of the IASI/Metop-A satellite measurements. The results represent the first detection of a significant recovery of O3 concurrently in the lower, in the mid-upper stratosphere and in the total column from one single dataset. They also show a speeding up in the recovery in the S.H. contrasting with a decline in the N.H.
Hydrochlorofluorocarbons (HCFC) are the first but temporary substitution products to the strong ozone depleting chloroflurocarbons (CFC). In this work, we present and validate an improved method to retrieve the most abundant HCFC in the atmosphere giving the opportunity to follow its evolution independently in the troposphere and stratosphere. These kind of contributions are fundamental to scrutinise the fulfilment of the Montreal Protocol on Substances that Deplete the Ozone Layer. We report on an evaluation of tropospheric ozone and its precursor gases in three atmospheric chemistry versions as implemented in ECMWF’s Integrated Forecasting System (IFS), referred to as IFS(CB05BASCOE), IFS(MOZART) and IFS(MOCAGE). This configuration of having various chemistry versions within IFS provides a quantification of uncertainties in CAMS trace gas products that are induced by chemistry modeling. 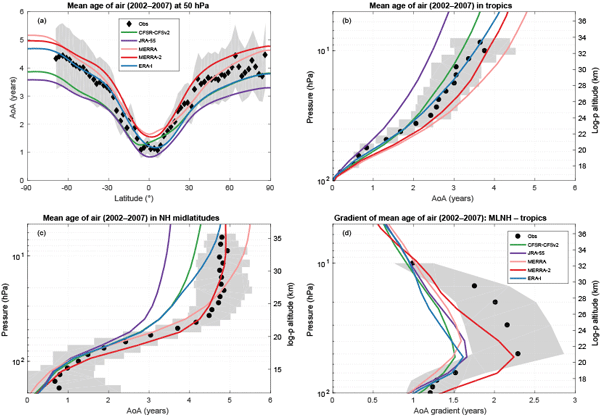 Mean age of stratospheric air is computed for the period 1989–2015 with a kinematic transport model which uses surface pressure and wind fields from five reanalyses: ERA-I, MERRA-2, MERRA, CFSR, JRA-55. 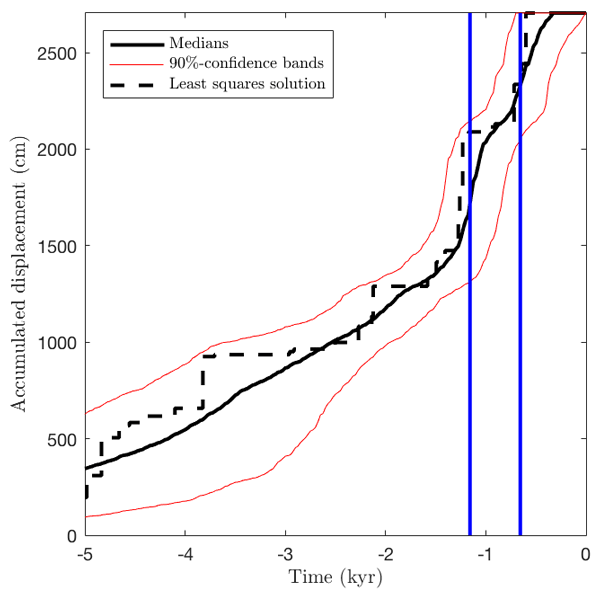 The spread between the resulting datasets is as large as in climate model intercomparisons; the age trends have large disagreement and depend strongly on the considered period. We highlight the need for similar studies using diabatic transport models which also use temperature and heating rates. We introduce the SPARC Reanalysis Intercomparison Project (S-RIP), review key concepts and elements of atmospheric reanalysis systems, and summarize the technical details of and differences among 11 of these systems. This work supports scientific studies and intercomparisons of reanalysis products by collecting these background materials and technical details into a single reference. We also address several common misunderstandings and points of confusion regarding reanalyses. We present a model description and benchmark evaluation of an extension of the tropospheric chemistry module in the ECMWF Integrated Forecasting System (IFS) with stratospheric chemistry. The stratospheric chemistry originates from the one used in the Belgian Assimilation System for Chemical ObsErvations (BASCOE), and is here combined with the modified CB05 chemistry module for the troposphere as currently used operationally in the Copernicus Atmosphere Monitoring Service (CAMS). The MACC project is preparing the operational atmosphere service of the European Copernicus Programme, and uses data assimilation to combine atmospheric models with available observations. Our paper provides an overview of the aerosol and trace gas validation activity of MACC. Topics are the validation requirements, the measurement data, the assimilation systems, the upgrade procedure, operational aspects and the scoring methods. A summary is provided of recent results, including special events. The paper presents results from data assimilation studies with the new Composition-IFS model developed in the MACC project. This system was used in MACC to produce daily analyses and 5-day forecasts of atmospheric composition and is now run daily in the EU’s Copernicus Atmosphere Monitoring Service. 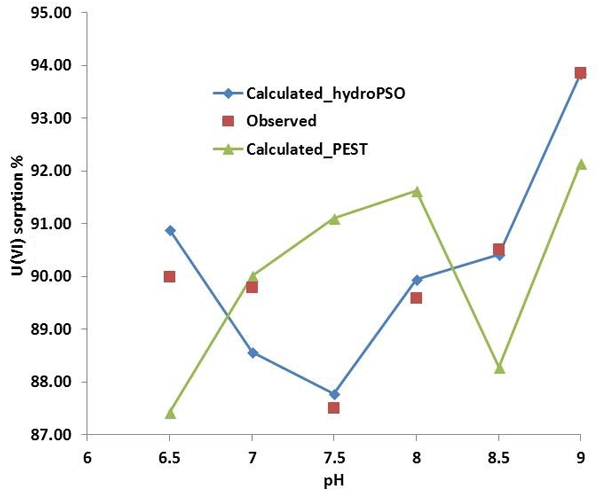 The paper looks at the quality of the CO, O3 and NO2 analysis fields obtained with this system, comparing them against observations, a control run and an older version of the model. We validate and discuss the analyses of stratospheric ozone delivered in near-real time between 2009 and 2012 by four different data assimilation systems: IFS-MOZART, BASCOE, SACADA and TM3DAM. It is shown that the characteristics of the assimilation systems are much less important than those of the assimilated data sets. A correct representation of the vertical distribution of ozone requires satellite observations which are well resolved vertically and extend into the lowermost stratosphere. The manuscript describes novel findings in the diurnal variation of stratospheric ozone by means of the MACC reanalysis, the ERA-Interim reanalysis and the WACCM model. The diurnal variation in ozone has dynamical and photochemical origins which lead to substantial amplitudes especially in the polar, stratospheric regions. The unprecedented, global view on diurnal ozone variation strengthens the implication to correct diurnally sampled satellite observations used for ozone trend estimates. We developed a new method for combining surface ozone observations from thousands of monitoring sites worldwide with the output from multiple atmospheric chemistry models. The result is a global surface ozone distribution with greater accuracy than any single model can achieve. We focused on an ozone metric relevant to human mortality caused by long-term ozone exposure. Our method can be applied to studies that quantify the impacts of ozone on human health and mortality. We summarize the results of the Dynamical Core Model Intercomparison Project's idealized supercell test case. Supercells are storm-scale weather phenomena that are a key target for next-generation, non-hydrostatic weather prediction models. We show that the dynamical cores of most global numerical models converge between approximately 1 and 0.5 km grid spacing for this test, although differences in final solution exist, particularly due to differing grid discretizations and numerical diffusion. We present a novel finite-volume dynamical core formulation considered for future numerical weather prediction at ECMWF. We demonstrate that this formulation can be competitive in terms of solution quality and computational efficiency to the proven spectral-transform dynamical core formulation currently operational at ECMWF, while providing a local, more scalable discretization, conservative and monotone advective transport, and flexible meshes. GemPy is an open-source Python-based 3-D structural geological modeling software, which allows the implicit (i.e. automatic) creation of complex geological models from interface and orientation data. GemPy is implemented in the programming language Python, making use of a highly efficient underlying library, Theano, for efficient code generation that performs automatic differentiation. This enables the link to probabilistic machine-learning and Bayesian inference frameworks. This paper presents the Fortran 90 source code for one-layer model GISS:IB on an icosahedral grid. The model solves the shallow water equations on the sphere using three symmetric horizontal components of angular momentum instead of velocity. One-layer shallow water models are a basic building block used in complex global weather and climate models. We present the VOLNA-OP2 tsunami simulation code, built on the OP2 library. It is unique among such solvers in its support for several high-performance computing platforms: CPUs, the Intel Xeon Phi, and GPUs. This is achieved in a way that the scientific code is kept separate from various parallel implementations, enabling easy maintainability. Scalability and efficiency are demonstrated on three supercomputers built with CPUs, Xeon Phi's, and GPUs. Seismic hazard assessment requires records of earthquake recurrence with many slip events. Current data from paleoseismology on individual faults are sparse and do not provide stable estimates of earthquake recurrence. We propose a statistical model-based method to study timings of earthquakes over the past few millennia. The results agree with historical earthquakes for faults in the Italian Apennines, and can aid future studies of fault interactions over multiple earthquake cycles. We discuss the question of whether weather forecast models that are based on deep learning and trained on atmospheric data can compete with conventional weather and climate models that are based on physical principles and the basic equations of motion. We discuss the question in the context of global weather forecasts. A toy model for global weather predictions will be presented and used to identify challenges and fundamental design choices for a forecast system based on neural networks. Large uncertainty is inherent in model predictions due to imperfect knowledge of how to describe the processes that a model is intended to represent. Yet methods to quantify and evaluate this model hypothesis uncertainty are limited. To address this, the multi-assumption architecture and testbed (MAAT) automates the generation of all possible models by combining multiple representations of multiple processes. MAAT provides a formal framework for quantification of model hypothesis uncertainty. 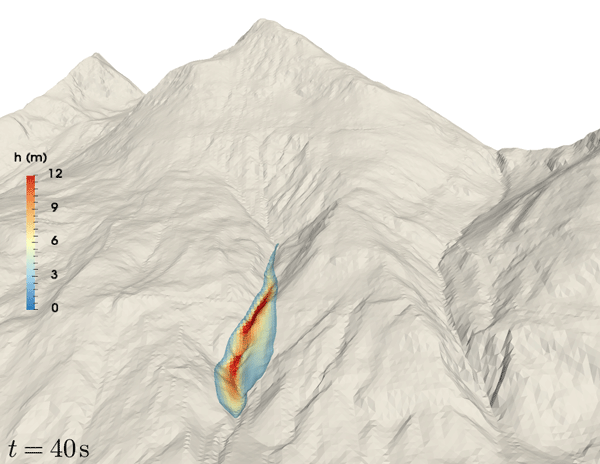 We present a physical model for the simulation of dense snow avalanches and other gravitational mass flows. The model is solved with OpenFOAM, a popular open-source toolkit for the numerical solution of partial differential equations. The solver has a modular design and is easy to extend. Therefore, it represents an ideal platform for implementing and testing new model approaches. 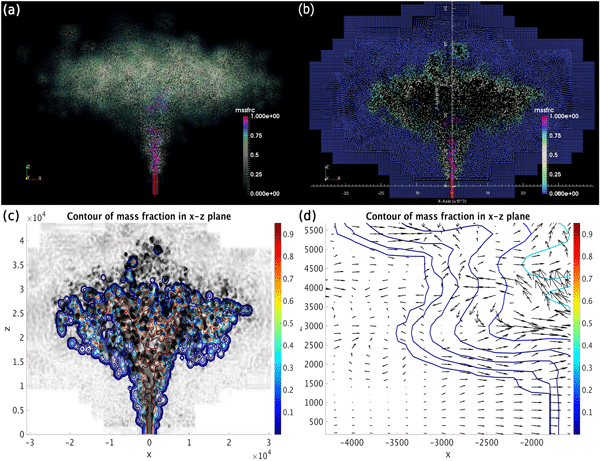 Plume-SPH provides the first particle-based simulation of volcanic plumes. Smooth particle hydrodynamics used here has several advantages over mesh-based methods for multiphase free boundary flows like volcanic plumes. This tool will provide more accurate eruption source terms to users of volcanic ash transport and dispersion models, greatly improving volcanic ash forecasts. The Plume-SPH code incorporates several newly developed techniques in SPH-needed multiphase compressible turbulent flow. Model output of quantities such as precipitation usually represents integrals, for example sums over 3 h. It is not trivial to interpolate a time series of such integral values to instantaneous precipitation rates conserving the integral values. A piecewise linear reconstruction is presented which fulfils the conservation, is non-negative, and is continuous at interval boundaries. It will be used in the FLEXPART Lagrangian dispersion model but has many other possible applications. We describe an optimisation suite ("Cyclops") that can be used to apply a selection of nonlinear optimisation algorithms to "tune" the parameters of a geophysical model. 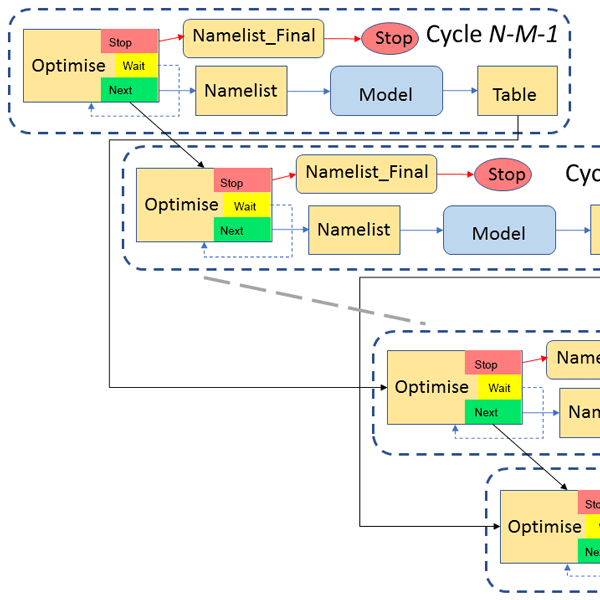 Based on the Cylc workflow engine, Cyclops can be used to calibrate any modelling system that has itself been implemented as a (separate) Cylc model suite, provided it includes computation and output of the desired scalar cost function. As the computational power of supercomputing systems increases, and models for simulating the fluid flow of the Earth's atmosphere operate at higher resolutions, new approaches for advancing these models in time will be necessary. In order to produce the best possible result in the least amount of time, we evaluate a number of splittings, methods, and solvers on two test cases. Based on these results, we identify the most accurate and efficient approaches for consideration in production models. The discontinuous Galerkin (DG) finite element method is well suited for the modelling of three-dimensional flows exhibiting strong density gradients. Here, a vertical adaptive mesh method is developed for DG finite element methods and implemented into SLIM 3D. This technique increases drastically the accuracy of simulations including strong stratification, without affecting the simulation cost. SLIM 3D is then used to simulate the thermocline oscillations of Lake Tanganyika. In this study, we performed an assessment of truncation errors and computational efficiency of trajectory calculations using six popular numerical integration schemes of the Runge–Kutta family. More than 5000 transport simulations for different seasons and regions of the free troposphere and stratosphere were conducted, driven by the latest version of ECMWF operational analyses and forecasts. The study provides guidelines to achieve the most accurate and efficient trajectory calculations. This study models the local inflow of groundwater at the bottom of a stream with large density gradients between the groundwater and surface water. Modelling salt and heat transport in a water body is very challenging, as it requires large computation times. Due to the circular local groundwater inflow and a negligible stream discharge, we assume axisymmetry around the inflow, which is easily implemented in an existing model, largely reduces the computation times, and still performs accurately. The paper details the sensitivity of vegetation properties that are input to a 3-D submerged aquatic vegetation model within a coupled hydrodynamics and wave model. It describes a novel strategy to perform sensitivity analysis efficiently by using a combination of the Effective Quadratures method and Sobol' indices. This method reduces the number of simulations to understand the sensitivity patterns and also quantifies the amount of sensitivity. We develop a novel and principled Bayesian statistical approach to computing model weights in climate change projection ensembles of regional climate models. The approach accounts for uncertainty in model bias, trend and internal variability. 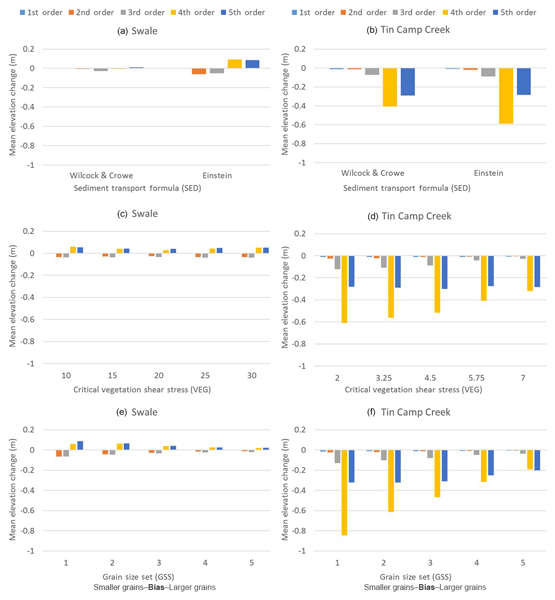 The weights are easily interpretable and the ensemble weighted models are shown to provide the correct coverage and improve upon existing methods in terms of providing narrower confidence intervals for climate change projections. 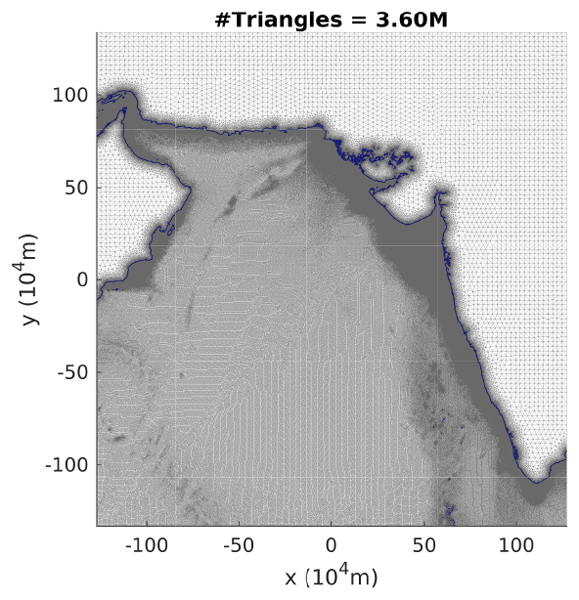 A new algorithm for the generation of very high-quality staggered unstructured grids for multi-resolution ocean and atmospheric modelling is described. Through use of unstructured triangulation and grid-optimisation techniques, it is shown that meshes satisfying a number of important a priori grid-quality constraints can be constructed. This new algorithm is expected to be of interest to both developers and users of unstructured general circulation models. The TRACMASS trajectory code with corresponding schemes has been improved and become more accurate and user friendly over the years. An outcome of the present study is that we strongly recommend the use of the time-dependent TRACMASS scheme. We would also like to dissuade the use of the more primitive stepwise-stationary scheme, since the velocity fields remain stationary for longer periods, creating abrupt discontinuities in the velocity fields and yielding inaccurate solutions. This paper describes conservative interpolation on the sphere. A function is computed on one mesh from its values on another mesh so that the total mass is preserved, which is vital for climate modeling, and for second-order accuracy. This is done through a common refinement of the meshes, built in quasilinear time by tree sorting the mesh cells. It can be built into climate models for flexible I/O or coupling. Examples of commonly used meshes are given. Many modern scientific research projects generate large amounts of data. Storage space is valuable and may be limited; hence compression is vital. We tested different compression methods for large gridded data sets, assessing the space savings and the amount of precision lost. We found a general trade-off between precision and compression, with compression well-predicted by the entropy of the data set. A method introduced here proved to be a competitive archive format for gridded numerical data. This paper demonstrates how important mass fixers can be in the simulation of long-lived greenhouse gases using transport models based on the highly efficient semi-Lagrangian advection scheme. Mass fixers can have a large impact on the representation of the inter-hemispheric gradient of CO2 and CH4, a crucial feature of their distribution. This work is relevant for models simulating atmospheric composition that use semi-Lagrangian advection schemes both for climate and air quality applications. This paper describes several improvements to the so-called "flood-fill algorithm" – a computer program widely known for its use in the "paint bucket" tool in several drawing programs such as MS Paint. However, it can also be used to determine the extent and depth of lakes in a topography map, which is useful in hydrology and climatology. In such cases, the default algorithm can be too slow to be of much use. Our improvements can make it up to 100 times faster, making it much more feasible. Refining model resolution is helpful for representing climate processes. With resolution increasing, the computational cost will become very huge. We designed a new solver to accelerate the high-resolution ocean simulation so as to reduce the computational cost and make full use of the computing resource of supercomputers. Our results show that the simulation speed of the improved ocean component with 0.1° resolution achieves 10.5 simulated years per wall-clock day on 16875 CPU cores. Unstructured meshes offer flexibility but are perceived as slow. Some applications, including atmosphere or ocean simulations, admit an extruded mesh: the horizontal mesh may be unstructured, but the vertical dimension can be traversed in a structured way. By extending the Firedrake automated simulation framework to this case, we show that an extruded mesh can be traversed as fast as a structured mesh. This paves the way for highly efficient unstructured mesh models of the ocean and atmosphere. We introduce Bit Grooming, a lossy compression algorithm that removes the bloat due to false precision, those bits and bytes beyond the meaningful precision of the data. Bit Grooming is statistically unbiased, applies to all floating-point numbers, and is easy to use. Bit Grooming reduces data storage requirements by 25–80 %. Unlike its best-known competitor Linear Packing, Bit Grooming imposes no software overhead on users, and guarantees its precision throughout the whole floating-point range. With the availability of lake surface water temperature (LSWT) satellite data for 246 globally distributed large lakes, we tune a lake model, FLake, by varying 3 basic lake properties, shown to have the most influence over the modelled LSWTs. Tuning reduces the mean absolute difference (between model and satellite LSWTs) from an average of 3.38 ºC per day (untuned model) to 0.85 ºC per day (tuned model). The effect of several LSWT drivers, such as wind speed and lake depth are also demonstrated. VISIR is a new numerical model for the computation of optimal ship routes from meteo-marine forecasts. VISIR offers the scientific community an open platform whereby various ideas and methods for ship route optimization can be shared, tested, and compared to each other. 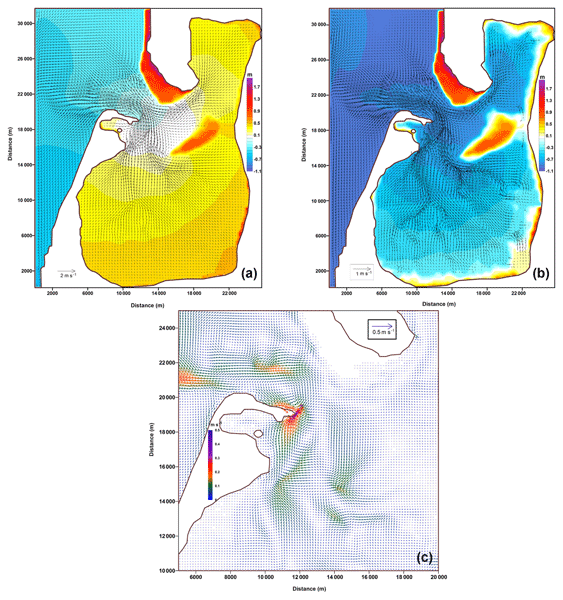 A new inverse modeling and simulation system is developed to enable efficient and reliable transport simulations of volcanic SO2 at large scale. The complex time- and altitude-dependent volcanic emission pattern of the Nabro eruption is identified by our inversion algorithm. The simulation results show good agreements with different satellite observations in terms of SO2 horizontal distributions, and help to further reveal the complex transport processes such as the Asian monsoon circulation. SiSeRHMap is a computer methodology for the mapped simulation of site seismic response (SSR) by means of a hybrid model. It combines physically based methods and adaptive and predictive numerical models that are solved in a layering GIS-geometric model. SiSeRHMap develops sets of different multispectral maps of site seismic response and other relating them, taking into account topography effects. Easy to use, SiSeRHMap seems to assure accuracy and robustness in the prediction performances. We briefly survey numerical methods for computing eigenvalues and eigenfunctions for the Laplace tidal equation. In particular we compare two methods that have numerical or conceptual advantages over the most commonly used methods. MATLAB codes are provided to facilitate their use. Researchers interested in atmospheric tidal analysis or in numerical methods for accurately computing eigenvalues of differential operators may find the paper helpful. The focus is on the development of low-order models of atmospheric transport and chemistry and their use for data assimilation purposes. A new low-order coupled chemistry meteorology model is developed. It consists of the Lorenz40-variable model used as a wind field coupled with a simple ozone photochemistry module. Advanced ensemble variational methods are applied to this model to obtain insights on the use of data assimilation with coupled models, in an offline mode or in an online mode. The paper presents a transport mechanism of SILAM CTM based on an algorithm of M. Galperin. We describe the original scheme and its updates needed for applications to long-living species, complex atmospheric flows, etc. The scheme is connected to vertical diffusion, chemical transformation and deposition algorithms. 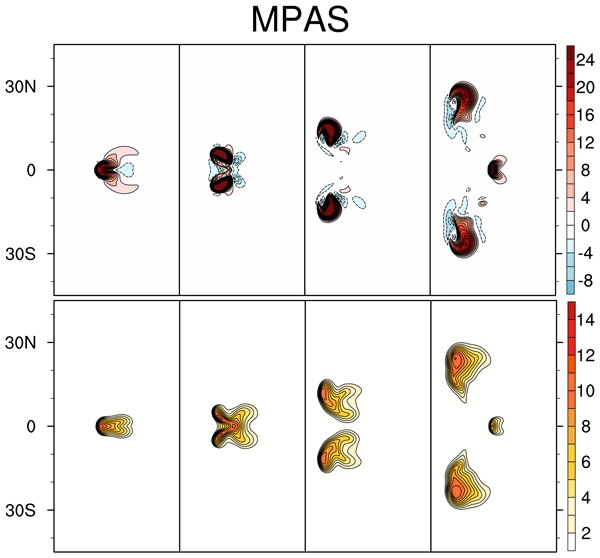 Quality of the advection routine is evaluated with a large set of tests, which showed performance fully comparable with state-of-the-art algorithms at much lower computational costs. CranSLIK is a model that predicts the movement and spread of a surface oil spill at sea via a statistical approach that takes into account the random, and hence unpredictable, nature, of the affecting parameters. CranSLIK v2.0 demonstrated significant forecasting improvements by capturing the oil spill accurately in real oil spill validation cases and also proved capable of simulating a broader range of oil spill scenarios, while maintaining the run-time efficiency of the method. The design of the icosahedral atmospheric dynamical core DYNAMICO is presented. The key contribution is to combine a strict separatation of kinematics from dynamics to a Hamiltonian formulation of the equations of motion in a non-Eulerian vertical coordinate to achieve energetic consistency. This approach allows for a unified treatment of various equations of motion: multi-layer shallow-water equations and hydrostatic primitive equations. The interparcel mixing algorithm in the Lagrangian advection scheme with shape matrix (LASM) is updated to make the scheme more robust. The new algorithm is more effective in controlling the shape of parcels, which is vital for long time simulation. LASM is inherently shape-preserving without any complicated filter or limiter, so it is linear. This fact contributes to the ability of LASM to preserve the sum of multiple tracers exactly. Here we present a concise interface to the NetCDF library designed to simplify reading and writing tasks of up to 6-D arrays in Fortran programs. This test extends the evaluation of transport schemes from prescribed advection of inert scalars to reactive species. It consists of transporting two reacting chlorine-like species in an idealized flow field. The sources/sinks are given by a simple but non-linear toy chemistry that mimics photolysis-driven processes near the solar terminator. As a result, strong gradients in the spatial distribution of the species develop near the edge of the terminator. The paper presents a statistical method (shrinkage) that can be used to estimate rough emission fields, e.g., fossil fuel CO2 emissions, from measurements of concentrations. This method is demonstrated in a test case where the emissions are modeled using wavelets. We find that the method can eliminate unnecessary complexity from the wavelet model, ensures non-negativity of the emissions, is computationally efficient and is, by construction, insensitive to prior guesses of the total emission. This paper accompanies the first release of libmpdata++, a C++ library implementing the multidimensional positive-definite advection transport algorithm (MPDATA) on a regular structured grid. The library offers basic numerical solvers for systems of generalised transport equations. All solvers offer parallelisation through domain decomposition using shared-memory parallelisation. The paper describes the library programming interface, and serves as a user guide. Model parameters are usually optimized based on measurements. These measurements are often time-consuming or costly. The conditions under which theses measurements are carried out, also called experimental designs, can be optimized so that with minimum effort and cost a maximum accuracy can be achieved. For this, we present different approaches together with their implementation in an MATLAB toolbox. We demonstrate their application to different models for sedimentation in salt marshes. 1. A gradient projection method was used to reduce the computation time of carbon-nitrogen spin-up processes in CLM4. 2. Point-scale simulations showed that the cyclic stability of total carbon for some cases differs from that of the periodic atmospheric forcing, and some cases even showed instability. 3. The instability issue is resolved after the hydrology scheme in CLM4 is replaced with a flow model for variably saturated porous media. Anderson, E. and Järvinen, H.: Variational quality control, Q. J. Roy. Meteor. Soc., 125, 697–722, https://doi.org/10.1002/qj.49712555416, 1999. Anderson, J. L.: Localization and Sampling Error Correction in Ensemble Kalman Filter Data Assimilation, Mon. Weather Rev., 140, 2359–2371, https://doi.org/10.1175/MWR-D-11-00013.1, 2012. Bernath, P. F., McElroy, C. T., Abrams, M. C., Boone, C. D., Butler, M., Camy-Peyret, C., Carleer, M., Clerbaux, C., Coheur, P.-F., Colin, R., DeCola, P., DeMazière, M., Drummond, J. R., Dufour, D., Evans, W. F. J., Fast, H., Fussen, D., Gilbert, K., Jennings, D. E., Llewellyn, E. J., Lowe, R. P., Mahieu, E., McConnell, J. C., McHugh, M., McLeod, S. D., Michaud, R., Midwinter, C., Nassar, R., Nichitiu, F., Nowlan, C., Rinsland, C. P., Rochon, Y. J., Rowlands, N., Semeniuk, K., Simon, P., Skelton, R., Sloan, J. J., Soucy, M.-A., Strong, K., Tremblay, P., Turnbull, D., Walker, K. A., Walkty, I., Wardle, D. A., Wehrle, V., Zander, R., and Zou, J.: Atmospheric Chemistry Experiment (ACE): Mission overview, Geophys. Res. Lett., 32, l15S01, https://doi.org/10.1029/2005GL022386, 2005. Bocquet, M., Elbern, H., Eskes, H., Hirtl, M., vZabkar, R., Carmichael, G. R., Flemming, J., Inness, A., Pagowski, M., Pérez Camaño, J. L., Saide, P. E., San Jose, R., Sofiev, M., Vira, J., Baklanov, A., Carnevale, C., Grell, G., and Seigneur, C.: Data assimilation in atmospheric chemistry models: current status and future prospects for coupled chemistry meteorology models, Atmos. Chem. Phys., 15, 5325–5358, https://doi.org/10.5194/acp-15-5325-2015, 2015. Brasseur, G. and Solomon, S.: Aeronomy of the middle atmosphere: chemistry and physics of the stratosphere and mesosphere, Springer Netherlands, Dordrecht, Reidel, https://doi.org/10.1007/1-4020-3824-0, 1986, 2005. Buehner, M., Houtekamer, P. L., Charette, C., Mitchell, H. L., and He, B.: Intercomparison of Variational Data Assimilation and the Ensemble Kalman Filter for Global Deterministic NWP. Part I: Description and Single-Observation Experiments, Mon. Weather Rev., 138, 1550–1566, 2010a. Buehner, M., Houtekamer, P. L., Charette, C., Mitchell, H. L., and He, B.: Intercomparison of Variational Data Assimilation and the Ensemble Kalman Filter for Global Deterministic NWP. Part II: One-Month Experiments with Real Observations, Mon. 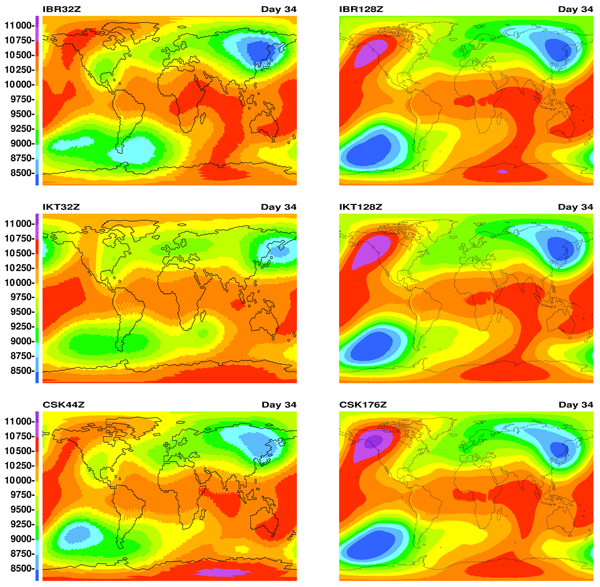 Weather Rev., 138, 1567–1586, 2010b. Cohn, S. E.: Dynamics of Short-Term Univariate Forecast Error Covariances, Mon. Weather Rev., 121, 3123–3148, 1993. Constantinescu, E. M., Chai, T., Sandu, A., and Carmichael, G. R.: Autoregressive models of background errors for chemical data assimilation, J. Geophys. Res.-Atmos., 112, d12309, https://doi.org/10.1029/2006JD008103, 2007. Courtier, P., Andersson, E., Heckley, W., Pailleux, J., Vasiljevic, D., Hamrud, M., Hollingsworth, A., Rabier, F., and Fisher, M.: The ECMWF implementation of three-dimensional variational assimilation (3D-Var). I: Formulation, Q. J. Roy. Meteor. Soc., 124, 1783–1807, 1998. Curier, R., Timmermans, R., Calabretta-Jongen, S., Eskes, H., Segers, A., Swart, D., and Schaap, M.: Improving ozone forecasts over Europe by synergistic use of the LOTOS-EUROS chemical transport model and in-situ measurements, Atmos. Environ., 60, 217–226, https://doi.org/10.1016/j.atmosenv.2012.06.017, 2012. Dee, D. P., Uppala, S. M., Simmons, A. J., Berrisford, P., Poli, P., Kobayashi, S., Andrae, U., Balmaseda, M. A., Balsamo, G., Bauer, P., Bechtold, P., Beljaars, A. C. M., van de Berg, L., Bidlot, J., Bormann, N., Delsol, C., Dragani, R., Fuentes, M., Geer, A. J., Haimberger, L., Healy, S. B., Hersbach, H., Hólm, E. V., Isaksen, L., Kållberg, P., Köhler, M., Matricardi, M., McNally, A. P., Monge-Sanz, B. M., Morcrette, J.-J., Park, B.-K., Peubey, C., de Rosnay, P., Tavolato, C., Thépaut, J.-N., and Vitart, F.: The ERA-Interim reanalysis: configuration and performance of the data assimilation system, Q. J. Roy. Meteor. Soc., 137, 553–597, 2011. Desroziers, G., Berre, L., Chapnik, B., and Poli, P.: Diagnosis of observation, background and analysis-error statistics in observation space, Q. J. Roy. Meteor. Soc., 131, 3385–3396, https://doi.org/10.1256/qj.05.108, 2005. 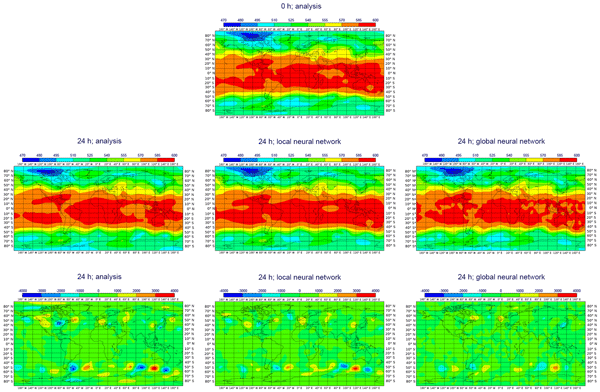 Eben, K., Juruş, P., Resler, J., Belda, M., Pelikán, E., Krüger, B. C., and Keder, J.: An ensemble Kalman filter for short-term forecasting of tropospheric ozone concentrations, Q. J. Roy. Meteor. Soc., 131, 3313–3322, https://doi.org/10.1256/qj.05.110, 2005. Errera, Q. and Ménard, R.: Technical Note: Spectral representation of spatial correlations in variational assimilation with grid point models and application to the Belgian Assimilation System for Chemical Observations (BASCOE), Atmos. Chem. Phys., 12, 10015–10031, https://doi.org/10.5194/acp-12-10015-2012, 2012. Errera, Q., Daerden, F., Chabrillat, S., Lambert, J. C., Lahoz, W. A., Viscardy, S., Bonjean, S., and Fonteyn, D.: 4D-Var assimilation of MIPAS chemical observations: ozone and nitrogen dioxide analyses, Atmos. Chem. Phys., 8, 6169–6187, https://doi.org/10.5194/acp-8-6169-2008, 2008. Froidevaux, L., Jiang, Y. B., Lambert, A., Livesey, N. J., Read, W. G., Waters, J. W., Browell, E. V., Hair, J. W., Avery, M. A., McGee, T. J., Twigg, L. W., Sumnicht, G. K., Jucks, K. W., Margitan, J. J., Sen, B., Stachnik, R. A., Toon, G. C., Bernath, P. F., Boone, C. D., Walker, K. A., Filipiak, M. J., Harwood, R. S., Fuller, R. A., Manney, G. L., Schwartz, M. J., Daffer, W. H., Drouin, B. J., Cofield, R. E., Cuddy, D. T., Jarnot, R. F., Knosp, B. W., Perun, V. S., Snyder, W. V., Stek, P. C., Thurstans, R. P., and Wagner, P. A.: Validation of Aura Microwave Limb Sounder stratospheric ozone measurements, J. Geophys. Res.-Atmos., 113, D15S20, https://doi.org/10.1029/2007JD008771, 2008a. Froidevaux, L., Jiang, Y. B., Lambert, A., Livesey, N. J., Read, W. G., Waters, J. W., Fuller, R. A., Marcy, T. P., Popp, P. J., Gao, R. S., Fahey, D. W., Jucks, K. W., Stachnik, R. A., Toon, G. C., Christensen, L. E., Webster, C. R., Bernath, P. F., Boone, C. D., Walker, K. A., Pumphrey, H. C., Harwood, R. S., Manney, G. L., Schwartz, M. J., Daffer, W. H., Drouin, B. J., Cofield, R. E., Cuddy, D. T., Jarnot, R. F., Knosp, B. W., Perun, V. S., Snyder, W. V., Stek, P. C., Thurstans, R. P., and Wagner, P. A.: Validation of Aura Microwave Limb Sounder HCl measurements, J. Geophys. Res.-Atmos., 113, d15S25, https://doi.org/10.1029/2007JD009025, 2008b. Funke, B., López-Puertas, M., von Clarmann, T., Stiller, G. P., Fischer, H., Glatthor, N., Grabowski, U., Höpfner, M., Kellmann, S., Kiefer, M., Linden, A., Mengistu Tsidu, G., Milz, M., Steck, T., and Wang, D. Y.: Retrieval of stratospheric NOx from 5.3 and 6.2 nm nonlocal thermodynamic equilibrium emissions measured by Michelson Interferometer for Passive Atmospheric Sounding (MIPAS) on Envisat, J. Geophys. Res.-Atmos., 110, d09302, https://doi.org/10.1029/2004JD005225, 2005. Gaspari, G. and Cohn, S. E.: Construction of correlation functions in two and three dimensions, Q. J. Roy. Meteor. Soc., 125, 723–757, 1999. Gaubert, B., Coman, A., Foret, G., Meleux, F., Ung, A., Rouil, L., Ionescu, A., Candau, Y., and Beekmann, M.: Regional scale ozone data assimilation using an ensemble Kalman filter and the CHIMERE chemical transport model, Geosci. Model Dev., 7, 283–302, https://doi.org/10.5194/gmd-7-283-2014, 2014. Gonnet, G. H. and Baeza-Yates, R.: Handbook of Algorithms and Data Structures: In Pascal and C, 2nd Edn., Addison-Wesley Longman Publishing Co., Inc., Boston, MA, USA, 1991. Hunt, B. R., Kalnay, E., Kostelich, E. J., Ott, E., Patil, D. J., Sauer, T., Szunyogh, I., Yorke, J. A., and Zimin, A. V.: Four-dimensional ensemble Kalman filtering, Tellus A, 56, 273–277, https://doi.org/10.1111/j.1600-0870.2004.00066.x, 2004. Kalnay, E., Li, H., Miyoshi, T., Yang, S.-C., and Ballabrera-Poy, J.: 4-D-Var or ensemble Kalman filter?, Tellus A, 59, 758–773, 2007. Laeng, A., Plieninger, J., von Clarmann, T., Grabowski, U., Stiller, G., Eckert, E., Glatthor, N., Haenel, F., Kellmann, S., Kiefer, M., Linden, A., Lossow, S., Deaver, L., Engel, A., Hervig, M., Levin, I., McHugh, M., Noël, S., Toon, G., and Walker, K.: Validation of MIPAS IMK/IAA methane profiles, Atmos. Meas. Tech., 8, 5251–5261, https://doi.org/10.5194/amt-8-5251-2015, 2015. Lambert, A., Read, W. G., Livesey, N. J., Santee, M. L., Manney, G. L., Froidevaux, L., Wu, D. L., Schwartz, M. J., Pumphrey, H. C., Jimenez, C., Nedoluha, G. E., Cofield, R. E., Cuddy, D. T., Daffer, W. H., Drouin, B. J., Fuller, R. A., Jarnot, R. F., Knosp, B. W., Pickett, H. M., Perun, V. S., Snyder, W. V., Stek, P. C., Thurstans, R. P., Wagner, P. A., Waters, J. W., Jucks, K. W., Toon, G. C., Stachnik, R. A., Bernath, P. F., Boone, C. D., Walker, K. A., Urban, J., Murtagh, D., Elkins, J. W., and Atlas, E.: Validation of the Aura Microwave Limb Sounder middle atmosphere water vapor and nitrous oxide measurements, J. Geophys. Res., 112, D24S36, https://doi.org/10.1029/2007JD008724, 2007. Lefever, K., van der A, R., Baier, F., Christophe, Y., Errera, Q., Eskes, H., Flemming, J., Inness, A., Jones, L., Lambert, J.-C., Langerock, B., Schultz, M. G., Stein, O., Wagner, A., and Chabrillat, S.: Copernicus stratospheric ozone service, 2009–2012: validation, system intercomparison and roles of input data sets, Atmos. Chem. Phys., 15, 2269–2293, https://doi.org/10.5194/acp-15-2269-2015, 2015. Li, H., Kalnay, E., and Miyoshi, T.: Simultaneous estimation of covariance inflation and observation errors within an ensemble Kalman filter, Quarterly J. Roy. Meteor. Soc., 135, 523–533, https://doi.org/10.1002/qj.371, 2009. Lin, S.-J. and Rood, R. B.: Multidimensional Flux-Form Semi-Lagrangian Transport Schemes, Mon. Weather Rev., 124, 2046–2070, 1996. Liu, C., Xiao, Q., and Wang, B.: An Ensemble-Based Four-Dimensional Variational Data Assimilation Scheme. Part I: Technical Formulation and Preliminary Test, Mon. Weather Rev., 136, 3363–3373, https://doi.org/10.1175/2008MWR2312.1, 2008. Livesey, N. J., Read, W. G., Wagner, P. A., Froidevaux, L., Lambert, A., Manney, G. L., Pumphrey, H. C., Santee, M. L., Schwartz, M. J., Wang, S., Fuller, R. A., Jarnot, R. F., Knosp, B. W., and Martinez, E.: Earth Observing System (EOS) Aura Microwave Limb Sounder (MLS) Version 4.2x Level 2 data quality and description document, Jpl d-33509 rev.a, Jet Propulsion Laboratory, available at: http://mls.jpl.nasa.gov/data/v4-2_data_quality_document.pdf (last access: 18 August 2016), 2015. Lorenc, A. C.: The potential of the ensemble Kalman filter for NWP – a comparison with 4D-Var, Q. J. Roy. Meteor. Soc., 129, 3183–3203, 2003. Lorenc, A. C., Bowler, N. E., Clayton, A. M., Pring, S. R., and Fairbairn, D.: Comparison of Hybrid-4DEnVar and Hybrid-4DVar Data Assimilation Methods for Global NWP, Mon. Weather Rev., 143, 212–229, https://doi.org/10.1175/MWR-D-14-00195.1, 2015. Madronich, S. and Flocke, S.: The Role of Solar Radiation in Atmospheric Chemistry, in: Environmental Photochemistry, edited by Boule, P., vol. 2/2L of The Handbook of Environmental Chemistry, Springer Berlin Heidelberg, 1–26, https://doi.org/10.1007/978-3-540-69044-3_1, 1999. Ménard, R.: Error covariance estimation methods based on analysis residuals: theoretical foundation and convergence properties derived from simplified observation networks, Q. J. Roy. Meteor. Soc., 142, 257–273, https://doi.org/10.1002/qj.2650, 2016. Ménard, R. and Chang, L.-P.: Assimilation of Stratospheric Chemical Tracer Observations Using a Kalman Filter. Part II: χ2-Validated Results and Analysis of Variance and Correlation Dynamics, Mon. Weather Rev., 128, 2672–2686, 2000. Ménard, R. and Daley, R.: The application of Kalman smoother theory to the estimation of 4DVAR error statistics, Tellus A, 48, 221–237, 1996. 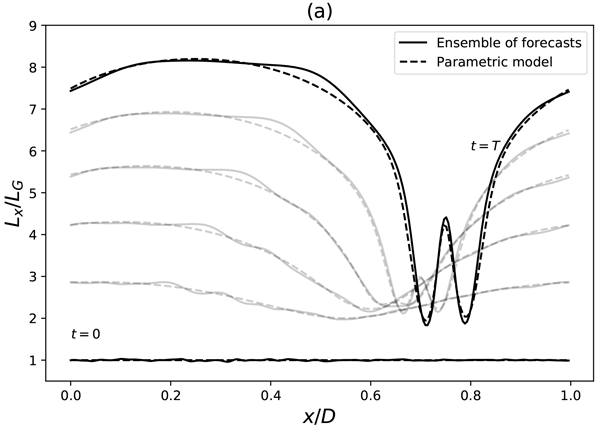 Mitchell, H. L. and Houtekamer, P. L.: An Adaptive Ensemble Kalman Filter, Mon. Weather Rev., 128, 416–433, https://doi.org/10.1175/1520-0493(2000)128<0416:AAEKF>2.0.CO;2, 2000. 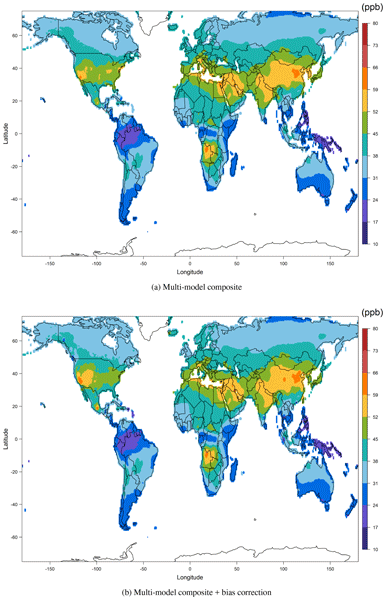 Miyazaki, K., Eskes, H. J., Sudo, K., Takigawa, M., van Weele, M., and Boersma, K. F.: Simultaneous assimilation of satellite NO2, O3, CO, and HNO3 data for the analysis of tropospheric chemical composition and emissions, Atmos. Chem. Phys., 12, 9545–9579, https://doi.org/10.5194/acp-12-9545-2012, 2012. Poterjoy, J. and Zhang, F.: Systematic Comparison of Four-Dimensional Data Assimilation Methods With and Without the Tangent Linear Model Using Hybrid Background Error Covariance: E4DVar versus 4DEnVar, Mon. Weather Rev., 143, 1601–1621, https://doi.org/10.1175/MWR-D-14-00224.1, 2015. Sander, S., Friedl, R., Golden, D., Kurylo, M., Moortgat, G., Keller-Rudek, H., Wine, P., Ravishankara, A., Kolb, C., Molina, M., Finlayson-Pitts, B., Huie, R., and Orkin, V.: Chemical Kinetics and Photochemical Data for Use in Atmospheric Studies. Evaluation Number 15, JPL Publication 06-2, Jet Propulsion Laboratory, Pasadena, available at: http://jpldataeval.jpl.nasa.gov (last access: 18 August 2016), 2006. Sankey, D. and Shepherd, T. G.: Correlations of long-lived chemical species in a middle atmosphere general circulation model, J. Geophys. Res.-Atmos., 108, 4494, https://doi.org/10.1029/2002JD002799, 2003. Santee, M. L., Lambert, A., Read, W. G., Livesey, N. J., Cofield, R. E., Cuddy, D. T., Daffer, W. H., Drouin, B. J., Froidevaux, L., Fuller, R. A., Jarnot, R. F., Knosp, B. W., Manney, G. L., Perun, V. S., Snyder, W. V., Stek, P. C., Thurstans, R. P., Wagner, P. A., Waters, J. W., Muscari, G., de Zafra, R. L., Dibb, J. E., Fahey, D. W., Popp, P. J., Marcy, T. P., Jucks, K. W., Toon, G. C., Stachnik, R. A., Bernath, P. F., Boone, C. D., Walker, K. A., Urban, J., and Murtagh, D.: Validation of the Aura Microwave Limb Sounder HNO3 measurements, J. Geophys. Res.-Atmos., 112, d24S40, https://doi.org/10.1029/2007JD008721, 2007. Skachko, S., Errera, Q., Ménard, R., Christophe, Y., and Chabrillat, S.: Comparison of the ensemble Kalman filter and 4D-Var assimilation methods using a stratospheric tracer transport model, Geosci. Model Dev., 7, 1451–1465, https://doi.org/10.5194/gmd-7-1451-2014, 2014. Strong, K., Wolff, M. A., Kerzenmacher, T. E., Walker, K. A., Bernath, P. F., Blumenstock, T., Boone, C., Catoire, V., Coffey, M., De Mazière, M., Demoulin, P., Duchatelet, P., Dupuy, E., Hannigan, J., Höpfner, M., Glatthor, N., Griffith, D. W. T., Jin, J. J., Jones, N., Jucks, K., Kuellmann, H., Kuttippurath, J., Lambert, A., Mahieu, E., McConnell, J. C., Mellqvist, J., Mikuteit, S., Murtagh, D. P., Notholt, J., Piccolo, C., Raspollini, P., Ridolfi, M., Robert, C., Schneider, M., Schrems, O., Semeniuk, K., Senten, C., Stiller, G. P., Strandberg, A., Taylor, J., Tétard, C., Toohey, M., Urban, J., Warneke, T., and Wood, S.: Validation of ACE-FTS N2O measurements, Atmos. Chem. Phys., 8, 4759–4786, https://doi.org/10.5194/acp-8-4759-2008, 2008. Talagrand, O. and Courtier, P.: Variational assimilation of meteorological observations with the adjoint vorticity equation. I: Theory, Q. J. Roy. Meteor. Soc., 113, 1311–1328, 1987. Tang, X., Zhu, J., Wang, Z. F., and Gbaguidi, A.: Improvement of ozone forecast over Beijing based on ensemble Kalman filter with simultaneous adjustment of initial conditions and emissions, Atmos. Chem. Phys., 11, 12901–12916, https://doi.org/10.5194/acp-11-12901-2011, 2011. In the present work, we performed a comparison of two broadly used data assimilation algorithms, 4D-Var and EnKF, applied to a state-of-the-art atmospheric chemistry transport model. The comparison is carried out using carefully calibrated error statistics. The paper discusses the advantages and disadvantages of each method applied to real-life conditions of a numerical atmospheric chemistry data assimilation.